Blue Rubicon had yet another impressive year. Despite a difficult economic backdrop it increased its income by 16 per cent, and profit margin to 26 per cent. This impressive financial performance was not at the expense of staff or clients. Staff churn remained at just ten per cent and the agency made some high profile hires, including the PM’s deputy head of digital Craig Elder and Peter Mandelson’s former special adviser Patrick Loughran. Neither joined to undertake public affairs work, instead spreading their skills across a diverse client portfolio. New clients included Coca-Cola GB, HSBC, GSK, Heathrow, Lloyd’s of London, The Olympic Park, Royal Mail and Western Union. BDO also hired the agency to be its global comms adviser and eBay handed it a brief to handle its employee engagement throughout Europe. The agency worked on Coca-Cola GB’s sponsorship of the Olympic Torch Relay as well as Coke’s Olympic celebration for 80,000 people in Hyde Park. It also worked with Heathrow to put the expansion of the airport back on to the agenda, despite it having being ruled out by the current Government when in opposition. The agency claims not to have lost a client since 2006. It certainly scores highly in its annual client satisfaction survey; in the past four years it has not scored below 4.4 out of five, which means its clients rate it between ‘very good’ and ‘outstanding’. Earlier this year, it also launched new offers Thirty Six Strategy, which takes the principles of political campaigns and applies them to commercial organisations, and Surname & Surname, which focuses on brand transformation. 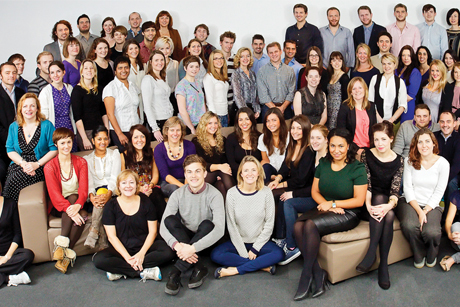 Blue Rubicon was also crowned PRWeek’s Large Agency of the Year.